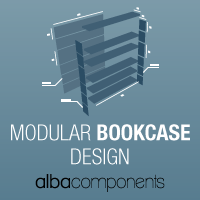 New product design contest on Desall.com: Metalmeccanica Alba and Desall invite the international community of creative talents to design a new combinable, modular and easily dismantlable bookcase, for the historical AlbaComponents brand. The history of Metalmeccanica Alba begins more than 30 years ago, and it continues today in the new and prestigious headquarters of Ca' Rainati in San Zenone degli Ezzelini, Treviso Province. A 6.000 square metres headquarter, manufacturing 1.500.000 seat frames, 300.000 stools, coat hangers and tables, and 1.400.000 frames for other furnishing components every year. The AlbaComponents products are designed and manufactured in Italy and today are available all around the world thanks to a commercial network which covers more than 60 countries. Design and innovation are key values for the brand that, working side by side with numerous designers, turns ideas and projects into new products. The passion, commitment and engagement of all the people working at AlbaComponents generate the best answers to the client requests. Since 1999 we are part of the TwinsNetwork, an international network of companies, point of reference in the research, design and manufacturing of components for the furnishing industry. The AlbaComponents brand is looking for a new combinable, modular and easily dismantlable bookcase, with a great aesthetic value and in line with the founding values of the brand, always paying attention to the detail and in search for the perfection while designing its own products. Product typology: the object of the contest is the design of a mid-low price bookcase, with a combinable, modular and easily dismantlable design, able to distinguish itself from the competitors for its style and attention to detail, giving maximum importance to the aesthetic qualities of the product. Combinability and modularity: you are invited to design a modular, combinable and easily dismantlable bookcase, thus enabling the user – who will take care of assembling the bookcase autonomously – to customise her/his product along its height and width, obtaining a versatile and bespoke solution based on her/his needs and contexts of use. Researched style: in line with the AlbaComponents brand, your bookcase shall have a modern, minimal, technical style, very attentive to details and with a great aesthetic value. It is of the greatest importance that the components become the main characters of your products. At your discretion you are free to choose the colour of the bookcase, as long as it suits well the various contexts of use. To learn more about the style, you are invited to have a look at the current product catalogue (see Material files). Functionalities and accessories: in order to allow for a greater customisation and further distinguish itself from competitors, your bookcase shall have tilting shelves that – at your discretion – might be equipped with LED lights, thus contributing to enriching the product style and functionality. Mounting/fixing modalities: your bookcase shall have wall-mounting capabilities, as well as floor or ceiling mounting capabilities, while maintaining a self-standing structure. It is of the greatest importance to evaluate how the combinability and modularity of the bookcase will be able to meet these requirements. Size: given its very modular and combinable nature, the bookcase shall be made of modules measuring max 100 cm for the width and a height at your discretion, as long as it complies with the standard dimensions for this product typology. Besides, keep into consideration that the bookcase shall be easily dismantlable. Materials, production technologies and costs: the bookcase may be realised with several materials, including iron, aluminium, wood, plastics (for ex. for some details, joints, etc. surely not for the shelves) and glass. Keep into consideration the industrialisation processes and the mass production technologies, in order to make the product feasible and manufacturable, with low production costs, given the mid-low price range of the product. The price to the public for a two-sides and four shelves configuration will be about Eur 400 + VAT. Surface finishing: for the bookcase you may suggest various post processing finishes, such as coating, chromium plating or wood finish. Where to use: the bookcase shall be destined to indoor use and will be employed in multiple contexts from both the contract and residential sectors, including schools, offices, shops, meeting rooms, living areas, other furnishing components or other contexts for the community. Target: the final user will be made of a very broad and varied public, depending on the context of use (contract or residential) and the product will be destined to North America, South America and Europe, for a low-mid price range. Values to convey: your bookcase shall comply with the brand identity of AlbaComponents and thus advocate those values that have always characterised it, such as the attention to detail, precision, product customisation, passion for work, backed by a great experience and know-how in the industry, a modern infrastructure and an on-going technological research. Deliverables: upload all the images that better present your projects (rendering, descriptions, CAD files, etc. ), showing various configurations and compositions, in order to highlight the modularity and combinability of your bookcase and at least a photo-realistic rendering with the product placed in the context. You are also invited to submit the 3D files inside a .ZIP archive, where you may also add further additional materials. Submissions providing additional information about the components and the product feasibility will be greatly appreciated. Concept revision: deadline for requiring an optional revision of your project by the Desall team. In order to request a revision, upload your project and save it as draft (SAVE DRAFT) from the upload page and send your request to the Desall Team via e-mail or through the contact form. The revision is NOT mandatory: it serves only as a further opportunity for the participants but does not constitute a condition for participation, nor does it constitute any advantage in the final evaluation. Participation is free of charge and open to designers and creative talents of any nationality aged 18 years or older. Participants can present one or more projects, but only the projects published on the www.desall.com web site, via the upload page related to “Modular Bookcase Design” will be accepted. The selection of the winner by Metalmeccanica Alba will be the result of an unquestionable evaluation and it will take into account originality, feasibility and consistency with the brief presented. Do you want to stay updated about "Modular Bookcase Design"?